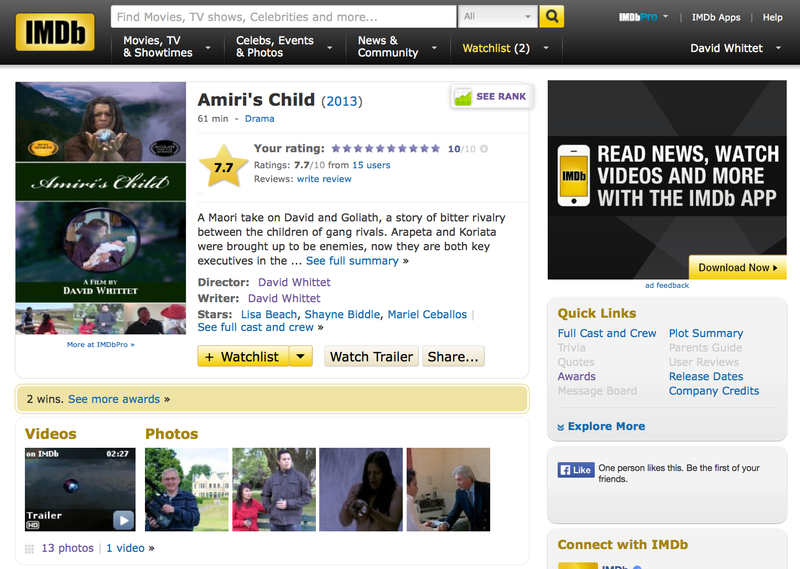 With our success at the Accolade Film Competition, Amiri's Child now has been granted a page on the Internet Movie Data Base (IMDb). IMDb is the prime resource for film makers and audiences alike and achieving IMDb listing is a significant goal for all film makers. Check out the Amiri's Child IMDb page here. We have also updated the Amiri & Aroha IMDb page with the cool new trailers. Check out the Amiri & Aroha IMDb page here. This blog covers all David's activities and includes the entries in his film making and specific project blogs. Click on a catogory below to explore a particular area of interest.